Belle Vue's unique and exclusive location overlooking the picturesque town of Kamuela (also known as Waimea) has an expansive view of the volcanoes Mauna Loa and Mauna Kea, and a breathtaking view of the Kohala Coast and the Pacific Ocean. We offer private, spacious suites, beautifully appointed and meticulously maintained, with living rooms, kitchens, bathrooms, bedrooms, TVs and private lanais. Offering Hawaiian hospitality with European charm, bordering World Famous Parker Ranch...quiet, serene, yet within walking distance of Waimea's fine restaurants and shopping. 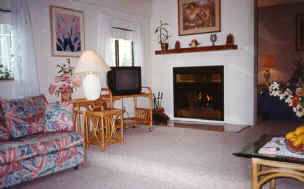 The penthouse has a living room, covered lanai, breakfast room, refrigerator, microwave, coffee maker, full private bath, a bedroom with a king size bed, a queen size sofa bed, a , television and large sun deck. 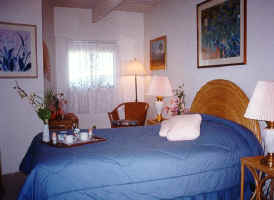 The suite consists of a complete studio apartment with breakfast room, refrigerator, microwave, coffee maker, full private bath, living room, bedroom with a Queen size bed, Queen size sofa bed, television and covered patio and garden. Your stay includes breakfast, fruit basket and complimentary tropical flowers. 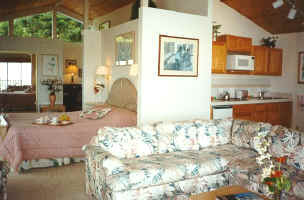 Rates: $95 to $175 double occupancy + state tax. We accept Visa, MasterCard, Travelers' checks or personal checks. Additional person $25.00. We offer weekly and monthly rates. Advance reservations are recommended (phone-fax-email). For a short stay, in order to ensure your reservation, a deposit equal to two night's stay (plus tax) is required. Your deposit will only be refunded if your cancellation is received prior to 72 hours before the first night of your stay, less a $50 cancellation fee. For an extended stay, a deposit of 50% is due at time of reservation, with a 6 week cancellation policy. "Spacieux avec une vue superbe, un acceuil fantastique. Un B et B exceptionnel! Tout a été parfait!" On parle Francais. Wir sprechen Deutsch.